I walked the back starting on eighteen and when I got to the par three fourteenth, noticed a volunteer spotter about half way up the left side. There’s a pond on the right so I guess he signals if the ball goes in the drink. But then I noticed something odd. All three players in the group I watched hit the green and had birdie putts. But after each tee shot, he would give the safe sign back to the tee as if they didn’t know where the ball went. DOH! 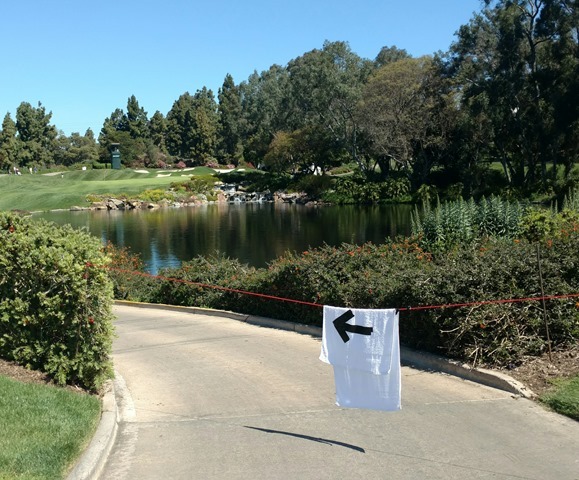 On the eleventh, the hole captain came up with a novel way to direct spectator traffic. A black arrow on a towel was draped on the gallery rope. That seemed to do the trick. This entry was posted on Friday, March 24th, 2017 at 6:18 pm and is filed under Uncategorized. You can follow any responses to this entry through the RSS 2.0 feed. You can leave a response, or trackback from your own site.